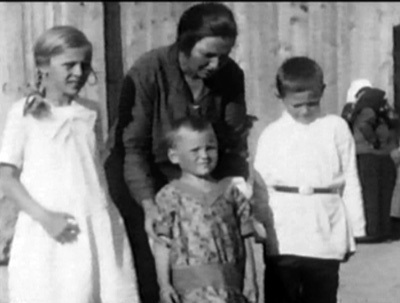 In the fall of 1928, Norka native, Heinrich Wacker returned to his home on the Volga. Heinrich (Henry) was born in Norka on September 7, 1888, the son of Conrad Wacker (born July 11, 1864) and Elisabeth Pauli (born August 19, 1863). 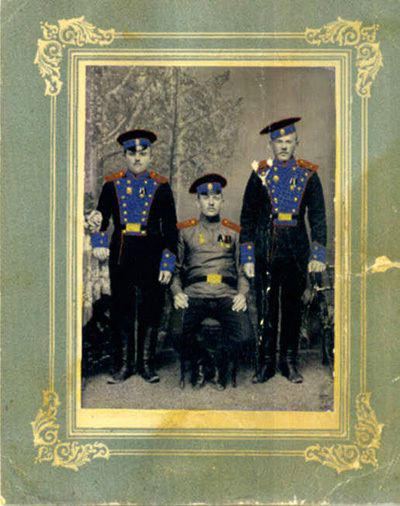 As a young man, he served in the Russian military for several years. On January 22, 1908, Henry married Amalia (Molly) Nagel who was born in Norka on October 6, 1885. Henry and Molly immigrated to the United States in May 1909, sponsored by Henry's uncle, Henry Pauli, of Portland, Oregon. Henry's wife Molly, and first-born son, John (born Nov. 1908), along with other relatives arrived in Portland in 1910. A daughter, Maria Wacker, was born February 4, 1911 in Portland. A second son, Conrad (Connie) Wacker was born November 11, 1912 in Portland. In 1912, Heinrich (Henry Walker) filed for U.S. Citizenship in Portland, Oregon and became a Naturalized citizen on November 20, 1916 in Portland. Henry and Molly's second daughter, Lydia Elizabeth Wacker, was born January 22, 1915 in Portland (she died July 1975 in Orange, California). A third son, Henry (Hank) G. Wacker was born October 1, 1921 in Vegreville, Canada (he died October 13, 1996 in Miami, Florida). Hank was a very famous photographer for LIFE Magazine from 1948 to 1963. Records show that Henry traveled frequently across the border to Alberta, Canada where he may have owned property. Henry had an aunt and uncle (Anna Catherina Wacker and Adam Giebelhaus) living in the Stony Plain area. Tricia Evans, a niece of Henry's, recalls that the two families were quite close and maintained communication throughout their lives. Henry Walker as a member of the Russian military is shown on the left of this photo provided courtesy of Tricia Evans. Tricia states "This photograph has the most terrific enamel painting on top of the black and white photography. The paint is original to the picture. I believe the picture is circa 1905 and was probably taken in Norka. On the back of photo, printed in Russian, are the words: Photography - G. Meyer." Henry watched future events in Russia with an anxious eye, and many of his relatives, including his brother John, remained in Russia. In 1921-22, there was a famine in Russia which was particularly severe along the Volga River. Anxious to know what had happened to his family and friend Henry, decided he would find a way to return to Norka and document conditions there with his 16mm movie camera. According to Arthur Flegel, Henry's travel expenses were paid in part by people who wanted to see their relatives in Norka. Passport and ship records document that in 1927 Henry traveled to Berlin, Germany in hopes of obtaining permission to travel to Russia and his native village of Norka. Unfortunately, Henry was unable to obtain a visa. He returned to New York on May 22, 1927 aboard the S.S. New York which sailed from Hamburg, Germany. In 1928, Henry traveled to Germany a second time, and with the help of someone at the German embassy he was able to reach Norka. It was during this trip that a film was made of conditions in Norka and the surrounding area. During this visit, Henry was in Norka approximately two weeks. 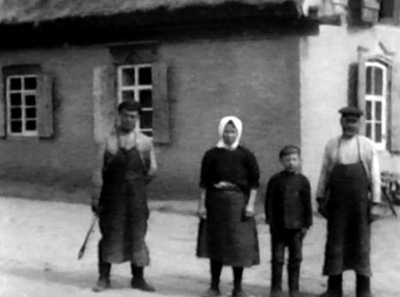 He filmed the village at considerable risk because of Soviet regulations against filming village scenes. It is believed that the contact at the German embassy who helped Henry reach Norka, also assisted in smuggling the film out through diplomatic protection. Henry returned to New York on October 22, 1928 aboard the S.S. Dresden sailing from Bremen. The harvest scenes shown in the film confirm that Heinrich was in Norka in the September/October time frame. Henry wanted to portray both positive and negative aspects of the conditions in Norka. He shows the only two brick houses in Norka, the white house belonging to the Albrecht family. There is also a harvesting scene in which the brother of Jacob Aschenbrenner of Portland, Oregon is shown. Another scene represents the relatives of Walter C. Krieger from Portland, Oregon (the husband of Marie Trupp Krieger). This scene shows four ladies in white, with a girl in a darker dress (who was the maid) in the center, standing on stairs leading to a porch. Seated in the foreground are an Aunt and Uncle of Walter (Henry and Dorothea Krieger) and seated behind them are Walter’s parents, Mr. and Mrs. Nicolaus Krieger. (Dorothea is the brother of Jacob Klaus). It is very possible that some of the scenes in the film were taken in the colonies of Balzer and Huck which are on one of the common travel routes to Norka from Saratov. For example, a close examination of the churches in the film indicate that there are three distinct buildings. Two of the churches in the film seem to correspond with photographs of the churches in Norka and Balzer. Another smaller church shown in the film is likely to be the one located in Huck. No photos of the church in Huck are known to exist, so this fact cannot be verified. According to Walter C. Krieger, before departing from Norka, Henry donated all of his clothing with the exception of what he was wearing. After Henry returned to Oregon, he often showed the film and gave talks about the conditions in Norka. He tried to gather money for the poor people of the colony of Norka, but had difficulty in forwarding the funds to Russia. At some time, Henry gave the film to his neighbor Jacob Aschenbrenner for safekeeping. Jacob Aschenbrenner’s nephew, Walter Krieger, often rented a projector as a boy to show the film to interested people. Henry moved to California in 1930 where he raised and fattened livestock (hogs) on a small ranch in Montebello (webmaster note: Montebello is near Asuza). The farm was located on the site of the current Lakewood Shopping Center (2008). Here he lived until a stroke took his life on January 22, 1953. Henry was known as the "Godfather" of our family. It was Henry who always stepped up to help a family member who was struggling. He was responsible for his brother Jack Walker, Jack's son Jackie Walker, his brother-in-law Bernie Nash, and my father Walter Henry Bauer having the ability to purchase trash disposal businesses in the southern California area during the 1940's through the 1960's. Uncle Henry also owned a trolley and taxi business in Portland before moving to California. He got my grandfather started with a trolley also. The film continued to remain in the Jacob Aschenbrenner home and was passed on to George Aschenbrenner, Jacob’s son. In 1973, the AHSGR convention was held in Portland, Oregon. At this time, Walter Krieger and Jack Deines took the film to a laboratory for inspection. At this time, they found that the film could be copied for $125, if they both helped to edit the film. Editing of the Norka film turned out to be quite difficult, because of the condition of the film. Several sections of the film were torn and therefore removed. The result is that some segments were misplaced, but on the whole everyone was satisfied with it. The film is a rare portrayal of life in the German colonies during the 1920's. The film was shown regularly in Portland's Volga German neighborhood after Walker's return from Russia. Several Portlander's (including Walter C. Krieger) recorded an audio tape in 1985 with their recollections as they watched the film. Two copies of the original 16mm film were made. One copy is held by the AHSGR headquarters in Lincoln, Nebraska and another copy was held by Marie and Walter Krieger in Portland, Oregon. The Krieger copy is now preserved at the Center for Volga German Studies at Concordia University in Portland. The copy in Lincoln was restored by the National Film Preservation Foundation. AHSGR released a DVD documentary based on this film in July 2016 and it is available in their online bookstore. A description of the film was prepared by Emma Schwabenland Haynes in 1978 and was updated by Jan Traci Roth (AHSGR staff) in 1998. The description states that Heinrich Wacker's first attempt to visit Russia was in 1926 and the second in 1927. These dates are incorrect based on passport applications and ship records. The correct years of travel were 1927 and 1928. This description is based in part on the following documents regarding the film obtained from The American Historical Society of Germans from Russia in Lincoln, Nebraska: Correspondence with Henry's son, Conrad Walker; Correspondence between Marie Walker and Emma Deines - November 1974; Correspondence between Walter Krieger and David J. Miller - January 1976; Correspondence between David J. Miller and AHSGR Board of Directors - February 1976. Heinrich’s grandson, Mr. Conrad Walker of San Diego, California, recalls 1927 as the year of the first trip, and 1928 as the date of the second trip. This information is confirmed by the passenger ship lists. Rachel Krieger Holmes, recalls information about the Henry Wacker film in her story Successful Research: "Like Finding a Needle in a Haystack". Tricia Evans, a niece of Henry Walker's. Tricia's maternal grandmother was Henry's sister. Passport application and passenger ship lists - Ancestry.com.